Dogs experience a variety of handling in their lifetimes. Most dogs will be hugged, have a child tug their tail, be restrained by a veterinarian, or have someone clip their nails. You can make all these situations less stressful by preparing your dog to be handled so it reacts calmly rather than with fear or aggression. Don't wait until the day you are going to take the dog to the groomer to start preparing them for handling. Instead, begin practicing long before your dog encounters a groomer, the vet, or a child who wants to give them a hug. The more time you can give your dog to get used to handling, the more likely it will be comfortable, and possibly even enjoy, these experiences. If you have a young puppy, you are ahead of the game. Puppies are usually much easier to teach to accept handling than older dogs. It's important to spend time socializing puppies to get them used to a variety of people and environments, including handling. If you regularly practice handling exercises with your puppy, by the time it hits about 4 months old, it should be comfortable with all types of handling. The most important rule when working to get any dog comfortable with being handled is to never force anything. This is not an exercise in controlling your dog, but rather training a dog to be relaxed and comfortable. For instance, if you want your dog to be comfortable with having its nails trimmed, don't start off by holding it down and forcing it to accept the grooming. If you know your dog likes to have its ears scratched or belly rubbed, start there. Talk to your dog softly, and slowly begin to explore other types of handling. For instance, you can gently play with your dog's feet and spread their toes as you would when clipping the nails so it becomes used to this touch. Try to practice several times each day for just a few minutes each time. 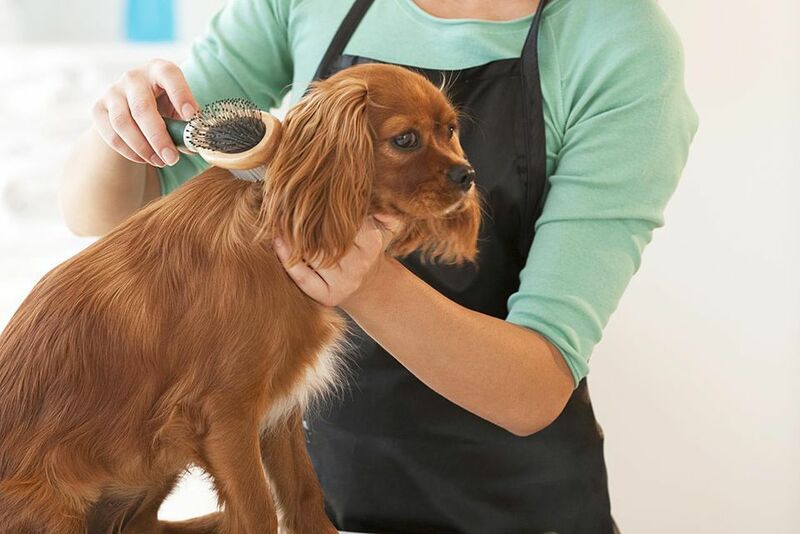 Slowly introduce your dog to various aspects of dog grooming. Start by just holding the grooming tool in one hand while you pet the dog with the other. Allow your dog to sniff the item if it's interested in it. Offer a few treats so the dog begins to associate the grooming tools with good things. Slowly begin to use the tools as you would when grooming. Touch the nail trimmer to one of your dog's nails while you talk softly and give it a treat. Practice several times, and then work up to trimming a nail. If your dog pulls away, let it. Give the dog time to relax and start over from the beginning. Soon you should be able to trim the nails while your dog remains calm. The same approach works for the brush. Begin by doing a few short, gentle strokes with the brush in a spot your dog likes to be scratched or pet. Be sure to give praise and treats. Work up to longer strokes, and allow the dog to move away if it becomes too uncomfortable. It won't be long before you will be able to give your dog a thorough brushing. Preparing your dog for veterinary exams is similar to grooming. There are several things dogs experience at the vet's office, such as being restrained and having their ears checked and teeth examined. In the same way that you did with the grooming tools, slowly accustom your dog to being held and having different parts of its body held and examined. Use a soothing tone of voice and treats to get it comfortable with handling. If at any point the dog tenses up or seems uncomfortable, go back a step and start from there. After a few sessions, you should be able to check your dog's teeth, look in its ears, and wrap your arms around its body with no problems. Once your dog is comfortable with you handling it, ask friends and other family members to help with this training. This will proof the good behavior and help your dog understand that you're not the only one who it should allow to do these things. Have the volunteers go through the same steps you did with your dog. Remember to go back to an earlier step at any time if the dog becomes uncomfortable. Some dogs become aggressive when different parts of their bodies are handled. If your dog shows any signs of aggression during handling exercises, stop immediately. Your best bet for dealing with an aggressive dog is to call in the help of an experienced dog trainer or behaviorist.